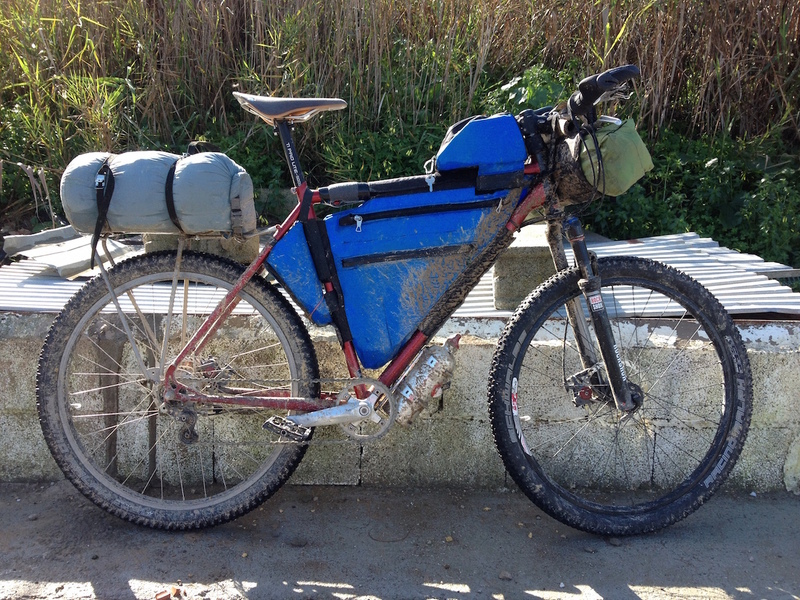 Now that I’ve spent about 1500km touring, Bikepacking and mountain biking with Red I think its fair to make an initial assessment of the choices I made and share my thought processes for this self build. 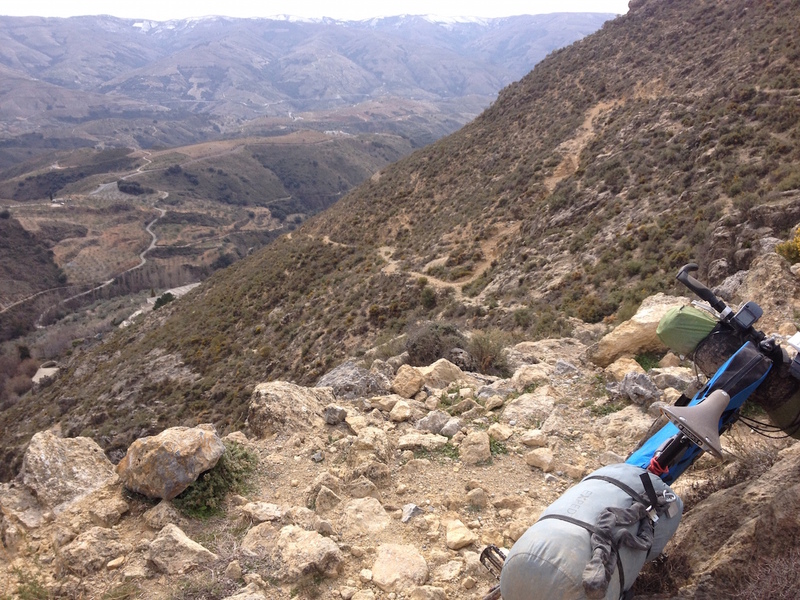 After several long tours on and off road in recent years, I was ready to see what this Bikepacking non-sense is all about and maybe try some moutainbiking. Therefore I wanted a bike that I could use for both. A second hand mountainbike would of been the logical choice but I found I’d be making too many compromises buying second hand as I had a number of thought as to what would make the perfect Bikepacking bike for me. I wasn’t too interested in a 29er or 27er either because I have that touring blood that still wants interchangeability with local bikes if I get stuck somewhere in a far off land. 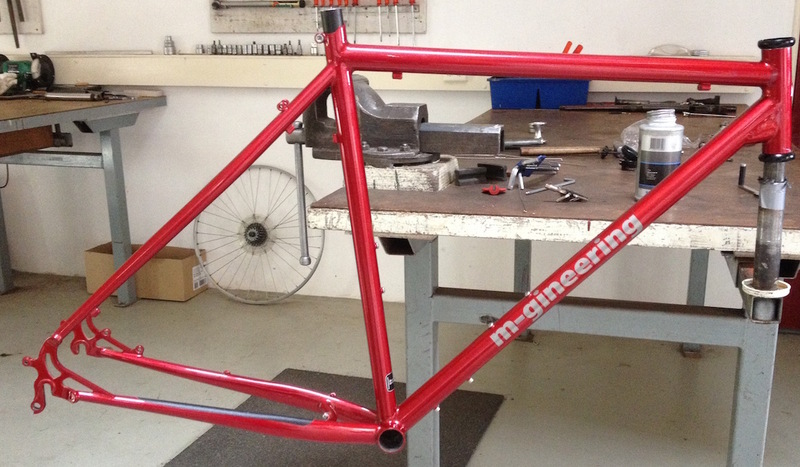 Ultimately I ended up getting my hands on a very nice steel frame (Reynolds 853) that had originally been hand built by M-gineering as an off road tourer(slightly longer wheelbase than a standard MTB, not to mention the details that only a bike spotter can see). The frame is in theory slightly too big for me but this means a lot of real estate for frame bags (which I made myself). With a short handle bar stem I was able to get reasonable geometry for both mountain biking and off road touring. This is generally accepted as a reliable touring fork and is fairly lightweight, with space for 2.4″ tires. Handbuilt by Equilibrium where I get many of my wheels built. This rim/hub combination gives a fairly bombproof wheel for the weight, I wouldn’t want a lighter rim for touring. Another important issue is to get one of the old XT hub models that still has a steel spindle rather than the modern (too) light aluminium ones. The rim is obviously on the heavy side for a mountain bike and at some point I’ll change the rim if I’m convinced that this wheel is staying with Red, for now its useable on 2 bikes by installing/removing the brake disc. Using a Rohloff is a no brainer if you already have one. Its slightly heavier than a derailleur setup but brings so many advantages that its worth that little extra weight in my opinion. Luckily when I bought my Rohloff hub in 2009 I had the foresight to buy one that is disc ready. BB7 is a disc brake operated by a cable, this seems to me to be the perfect combination of reliability, braking power and convenience for on road maintenance. I’m not used to having so much braking power and it was great fun 🙂 The ease of adjusting the brake pads and the lack of hydraulics are a big bonus in my opinion. I’m a through and through brooks fan so thought I’d give the new lightweight and waterproof rubberised version of their leather saddles a try. I’m not that impressed, in 30,000km+ my bum has never been so sore while cycling. Random lightweight stuff( and not Ti) . The bolts on the seat post seem a little thin, fingers cross my fat arse doesn’t break them. I also have Ergo handlebar grips on the bars which I stole off my Brompton for the Spain trip. A nice lightweight tire that performed well with the mix of dirt, gravel, rocks and asphalt. I used 2.25″ this time, next time I’ll go slightly wider. I can fit 2.4″ in the front and close to 3″ at the back. At some point I may do a (Ghetto) tubeless conversion too. The surly is a nice bombproof chainring and well worth the extra couple of grams. Nowadays 36×17 is allowed by Rohloff (don’t tell them I’ve been using it for years) it gives an excellent low granny gear. Shimano PD-A530 is a nice combi pedal(spd one side, flat on the other) that I’ve had on all my bikes at home for about the last year or so, not sure about how durable they are yet though. Blackspire sub4 Seems like a nice light weight alternative to the Wellgo platform pedals (heavier) I’ve used previously on longer trips. Time will tell how these compare in durability. Unlike many other Bikepackers I haven’t gone for a seatpost bag. I see no real advantage in having one. I have a hardtail bike so can use a rack. Using the 300g Titan Airy + a dry bag of 2-300g isn’t much heavier than a seat post bag but it is much more stable and has a slightly lower C of G plus the ability to carry that little extra food now and again. 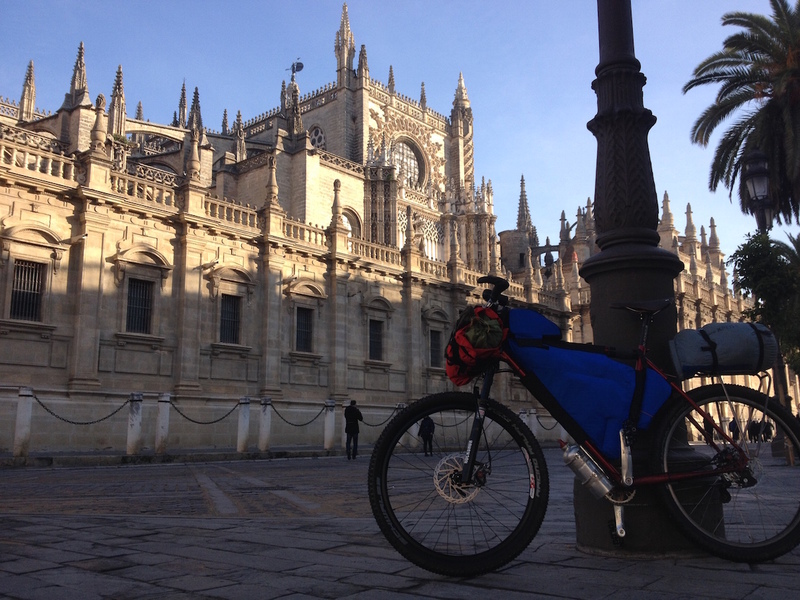 Admittedly a Tubus titan airy is far from cheap but it isn’t much more expensive than most seat posts bags (apparently Bikepacking is an expensive hobby if you buy commercially) My solution is more practical and certainly gives more versatility. The bike weighs in at a non light-weight but respectable 14kg including rack and pedals. Knowing where the frame came from I had no problem jumping in at the deep end and cycling the Transandalucia despite only doing a couple of short test rides on a local MTB track. 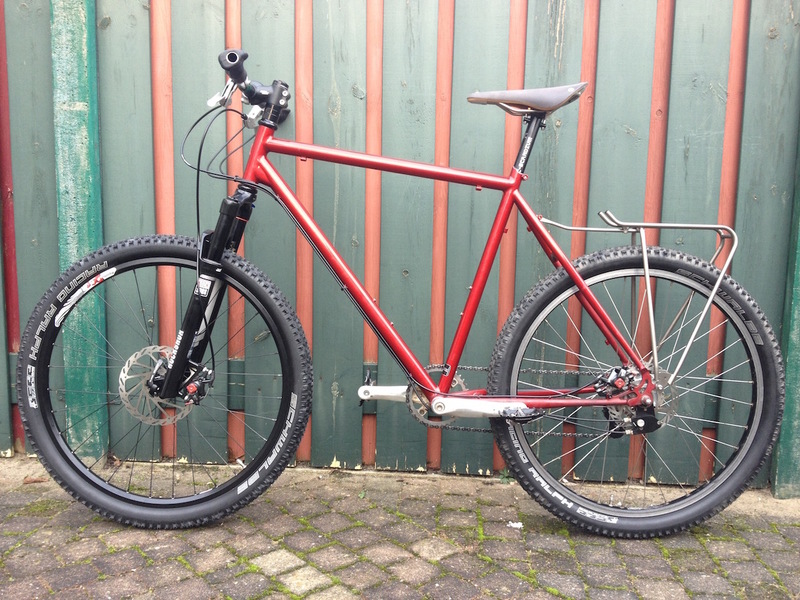 Red is a pleasure to ride on and off road, and light enough for this amateur to do some weekend mountain biking too. The only thing I may change in the short term is the saddle and the jury is still out whether I want a front fork with suspension while touring, even off road. When travelling light on remote hiking trails there’s something to be said for almost 1kg less fork and less maintenance worries if you have slightly fatter tires to save your wrists and forearms. 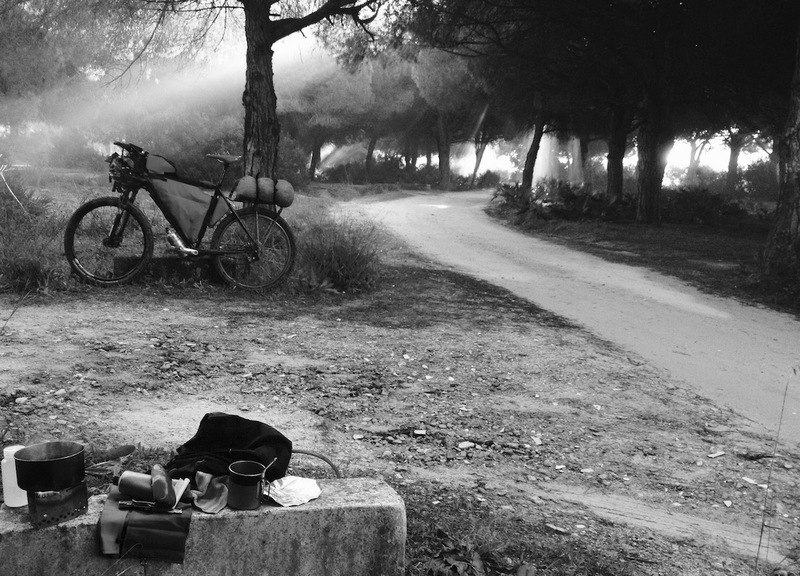 Apart from that I’m still behind all the choices I made for this Bikepacking setup. Despite robbing some parts off other bikes and parts lying around my shed I did buy a lot of new parts. Therefore this ended out being quite an expensive bike. But I think its fair to say I got the build about right first time, so have a wonderful Bikepacking machine for years to come. Saddles are a completely personal, subjective and unpredictable thing. 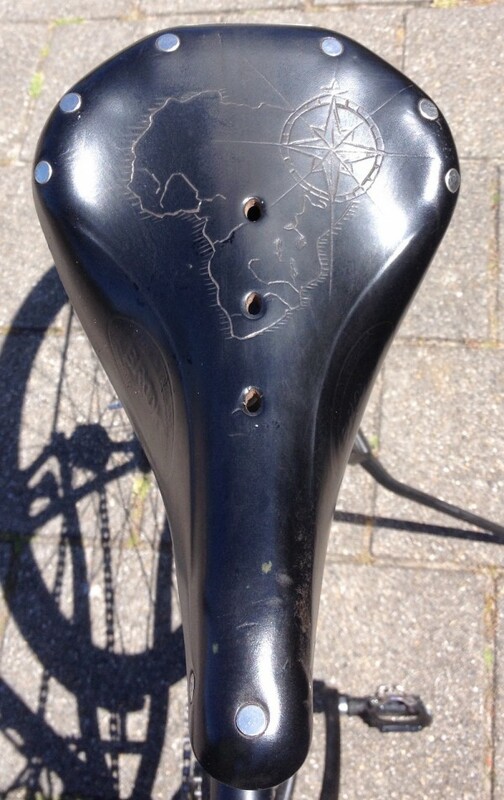 I rode a Cambium 12000k through Africa – saddle sores came early, went, then never came back. I was happy with it. Still use it although it had a battering and is looking tired now. It’s an expensive experiment but I encourage you to try a Thudbuster post if you haven’t already done so. I remained seated through endless day long corrugations in Namibia. My co-riders did not. Still – whatever – I like your bike. Totally agree that a saddle is a very personal thing. I think I’ve just gone soft because my Brooks flyer is so comfy (and still looking good) after 25,000km (half of which was in Africa). I noticed for the Freedom Challenge you used this bike with the Jones H Bar Loop. How did you find them with Ergon grips???? I’ve already tried the Loop bar, but I had a pinch point in my wrists. And with this went back to my straight bars. I’ve not totally given up on the Jones bar, as I’ve recently completed the Munda Biddi Trail in Western Austraila (https://www.mundabiddi.org.au) and as the Jones is perfectly suited to single track, these would have been a good testing ride for them. On that note, if you ever want a good-long-MTB trip, this is the one… its so so good! 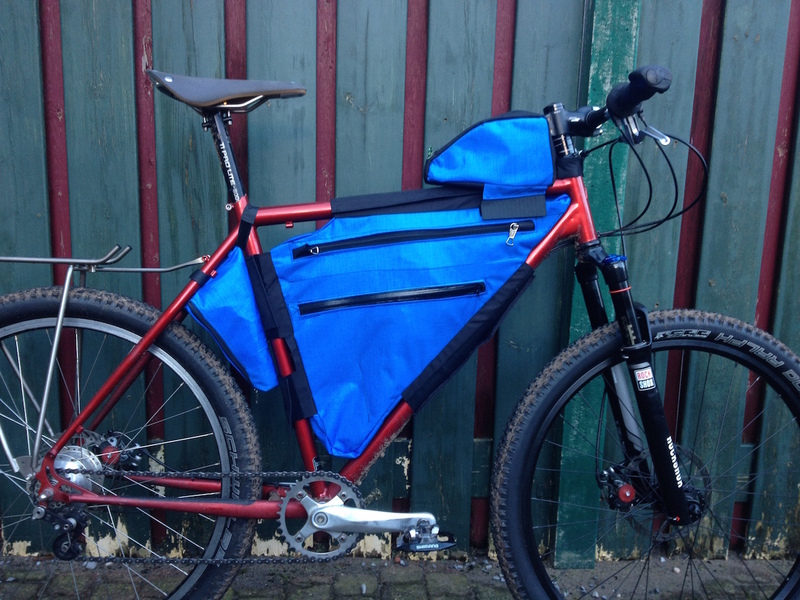 I did it too with full panniers, but used the small Ortliebs on the back. All very manageable even on the rough sections. Fantastic huts enroute if needed (rain water tanks) and I hardly saw anyone on the whole trail. I’ve considered walking/riding the Munda Biddi for years. Don’t see myself flying that far for a while though :). I love the H-bars, I think they’re ideal for off road touring. More hand positions than flat bars, more control and braking than drop bars. 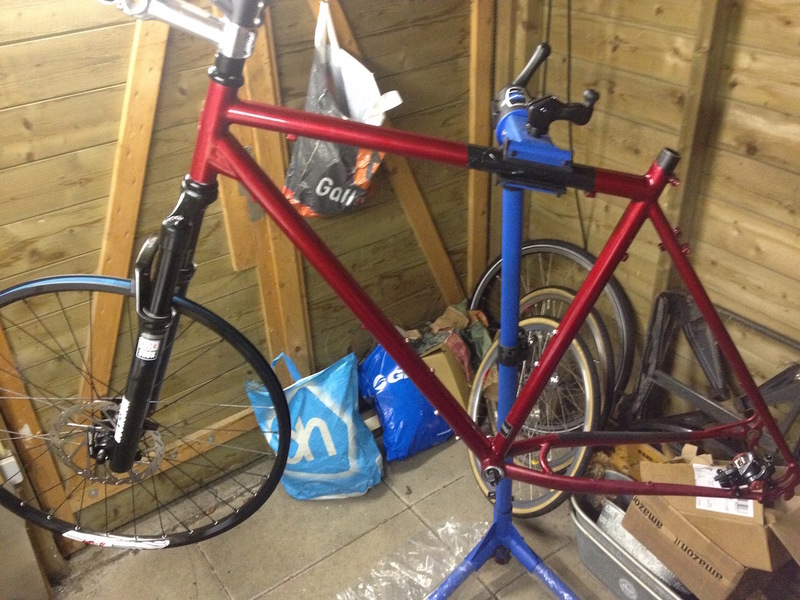 I’m planning on riding the Trans Germany in Juli and its going to be a close thing whether I choose flat bars with aerobars or the Jones H-bar. Already planning in my head, where next!? Must say I like the Trans German route… not too race though! 🙂 As the say in Swahili ‘Pole Pole’ (Slowly Slowly)! I’m going to try the Ergon GC1 Biokork grips. Also keen on getting the lowest possible ‘granny’ gear? Yup is a Chain tensioner from Rohloff. Works really well, though the last 2 have worn out quicker than I would of liked (5-10,000km). Once the bushes get worn out the the thing twists a little and the chain starts rubbing on the cage. Just remember to think about the anti rotation arm from the hub to the frame and cable routing (I have the ex rolloff so just run the shifter cables to the external box and tie wrap them to the frame).